Last week I grilled dinner for the family: salmon and chicken with a soyaki sauce from Trader Joe’s. In preparation, I went to a local wine store to pick up a pinot noir to enjoy with the salmon and found something I’d not seen before sporting a low-brow label. “C’est La Vie! Pinor Noir•Syrah 2011 Vin De Pays” for $12. 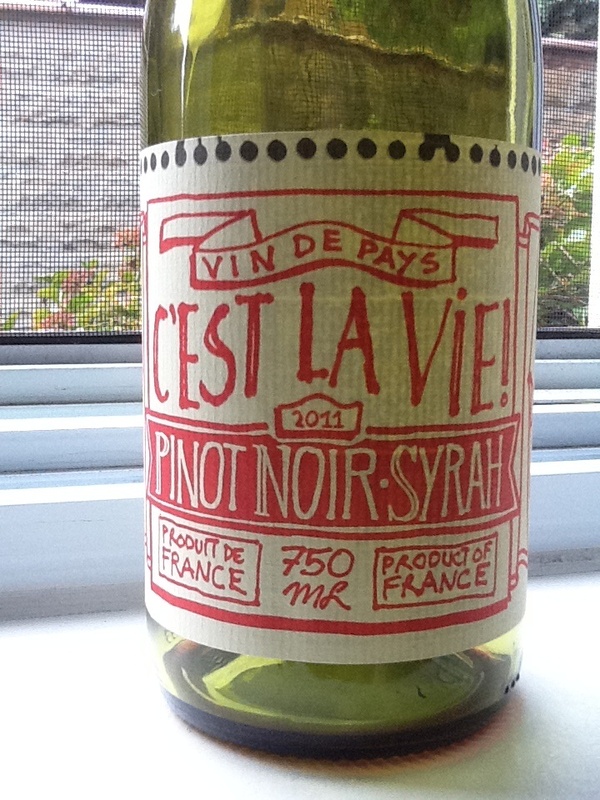 So, by the label it advertises itself as a French country wine, a blend of pinot noir and syrah grapes, a young 2011, but obviously intended to be imbibed young. With a cutesy label design of bright red letters on a beige background using a hand-drawn font and spiral notebook theme, the title is even repeated on the easy access screwtop. But enough about the label, let’s get to the juice! The wine is bright ruby red in the glass, the nose is black cherry and raspberry with a hint of violet. The first taste is all fruit: massive red cherry and raspberry, a touch of strawberry with a note of licorice, some white pepper and spice box with a hint of clay. 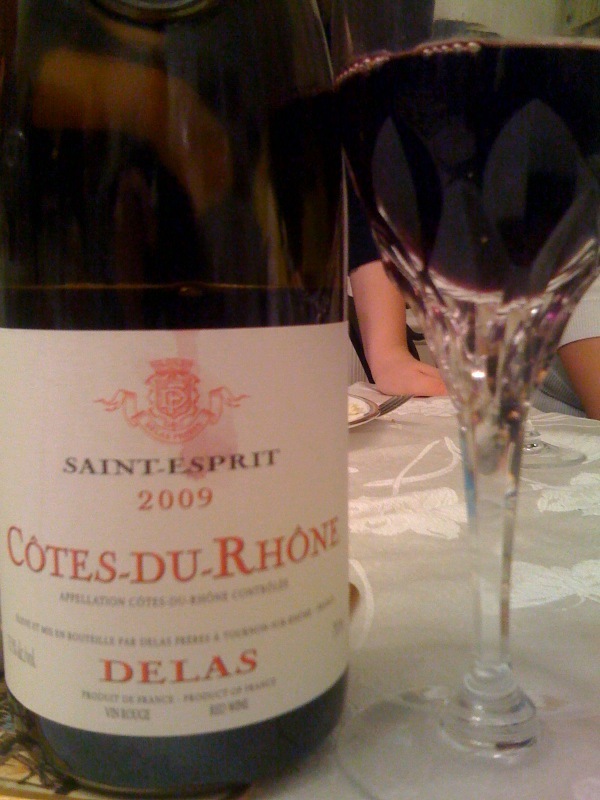 After the initial burst, the wine sports a nice, tart finish that leaves a slight pucker and the mouth wanting more. I tried this wine over three meals and found it paired nicely with salmon, cheese, and even with chili, believe it or not. I enjoyed it each time. This is by no means a fancy or expensive wine your guests will swoon over, but it’s a good daily table wine that pairs easily and does the job. So why a blend of 60% pinot noir and 40% syrah? That’s not as easy as it sounds, as the two grapes would not naturally complement one another and are usually single grape wines. By itself the pinot noir might be too light, but the syrah in this blend adds power, bite and color to make a well made red that is ready to drink without aging. The careful balance of the two grapes (fruity, smooth, forward, spicy) open up the possibilities of pairing, making this wine ever more useful to the chef or host. What I found most interesting is that red, which appears unassuming at first, is actually a product from the established vineyards of winemaker Albert Bichon (whose name is no longer on the label) and the Languedoc Roussillon region. Imported by Gabriella Importers (a link to their site is here). If you’re interested in some of the winemaker’s history, wines or terroir, check out this well-written article from 2007 from terroirs.com about Albert Bichot. or the Bichot website here, featuring some of their premiere cru wines. At the end of the day, this standard vin du table is a good value for your cellar when you want an inexpensive French country wine to complement your meal. I found this locally for $12/bottle which is on the pricier side, as online it lists from $9/bottle. A Way To Identify Smells In Your Wine! Many of my friends and wine associates have challenges in identifying wine aromas. This is a fun article that describes a wonderful approach to expanding your sense and ability to smell and describe wine! A link to the article is here, and the text follows. Ross Szabo does a great job. Enjoy, and follow his work on Huffington Post! As a person who rarely even selects which wine to drink when I am out for dinner, I am definitely a novice when it comes to properly identifying wine aromas. I can’t tell you how many times I have put my nose over a glass and guessed, purely out of embarrassment. When tasting in the past, everyone’s nose seemed better than mine, like they had an inside secret I would never know. I felt like I had some kind of impairment that would never be cured. A large part of the problem was that I wasn’t in touch with my senses enough to know what words to use to verbalize the scents wafting past my face. When I don’t feel like I have words to describe what seems so commonplace to others, like most people in this situation I feel stupid and hesitant to speak up. However, all that changed with one simple exercise that anyone can do at home! This isn’t a wine infomercial. I promise. Here are the three simple steps to properly identifying aromas. You can even use them to throw a party. 1. It’s important to include a variety of different whites and reds during this exercise. We had six glasses of wine for each person, including Torrontes, Chardonnay, Rose, Pinot Noir, Malbec and Cabernet Franc. During our aroma ID session with Mariana, we smelled and tasted each wine one at a time. The first sniff should always be done before swirling the wine to preserve the purity. 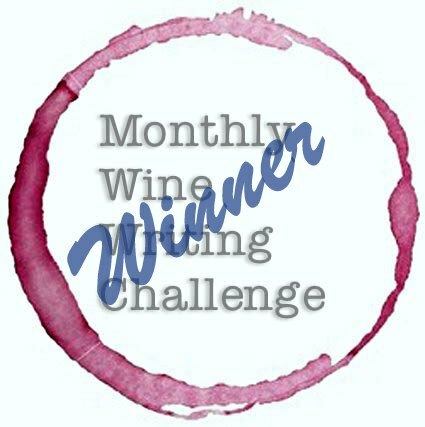 This exercise is to learn the scents, so it’s important not to drink all of the wine, as you will be smelling and tasting them again. As we smelled each wine, I expressed to Heidi my lifelong frustration with not knowing how to describe the odors. Then the magic happened. 2. We took a break from smelling the wines and played a game. There were 16 ingredients placed into individual short, black, opaque wine glasses. At home you could use coffee mugs, or small plastic cups — just as long as you cannot see what’s inside. We passed around the glasses and wrote down what we smelled in each of them. When we couldn’t identify exactly what was in the glass, it helped to write down memories the scents evoked. For example, Heidi’s answers consisted of ocean, grass, Christmas and other familiar memories from her life. For me, Chardonnay smelled like fresh pancakes from my childhood, but I was actually identifying the buttery nature of the varietal. Smell often triggers memories. If they do, you should write down that feeling. The important thing is that this exercise is not about being correct, it’s about becoming more in touch with your senses and references from your world. After writing down our thoughts, Mariana told us the answers, and the hidden scents came alive one by one. The ingredients were green olives, orange, honey, chamomile, fruit jam, pepper seasoning, butter, lemon, vanilla, red pepper, pineapple, black licorice, green pepper, caramel, cinnamon and apple. We kept score to see who had correctly identified the most items. You can come up with a fun punishment for the person who has the lowest amount of correct answers. 3. The next step was to go back to the wines and smell them again. For me the bouquet of smells came alive from every glass. Because we had taken the time to identify the individual aromas earlier, it all clicked for me now as I smelled the wines. I finally felt like I was part of the club that could identify different aromas of wines, instead of just looking around the room and trying to fit in or giving up on the idea of ever having this skill. Being comfortable with the words to describe the smells has changed my entire wine tasting experience. It’s easy, and a lot of fun, to replicate this process at home. Invite some of your friends over and have each of them bring a different wine. There will always be cheaters trying to see what is in the hidden cups. Try to discourage them, as it is so much more important to be identifying with your own experience, rather than “the right” answer. You’ll be amazed at how well the sniffing experiment works. Goodbye Budget Bordeaux, Welcome, Next Vintage! I bought a case of this in 2008 when it was a promising claret and I managed to find it for around $13/bottle. I recently went thru my cellar and pulled the last remaining soldier from my stores, knowing it might last longer but even the best of cellars isn’t impervious to the humidity of a bad August. This Bordeaux blend’s color is dark garnet moving to deep ruby. It shows a sweet berry and red floral nose with a touch of wood. On the palate: plump black cherry, plum and some strawberry with earth, leather, gravel, and notes of vanilla and oak. 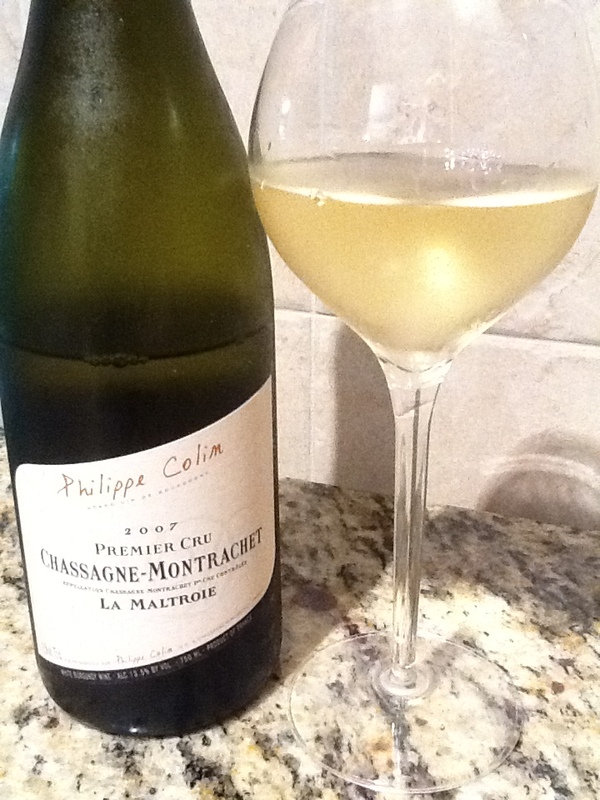 A nice, grippy finish – a tad tight still by itself, but would be perfect with rich food to complement. I’m sorry I don’t have another case to keep enjoying. I’ll be looking for something similar to this to fill the gaps. 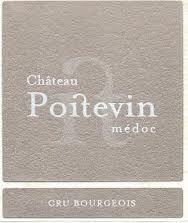 Oops, looks like Decanter magazine rated the 2008 Poitevin very highly (#8) in their budget Bordeaux roundup! From $8-20/bottle, this wine ages well in the cellar and can be enjoyed while young- making it even more valuable. You can check out the vineyard’s website here. 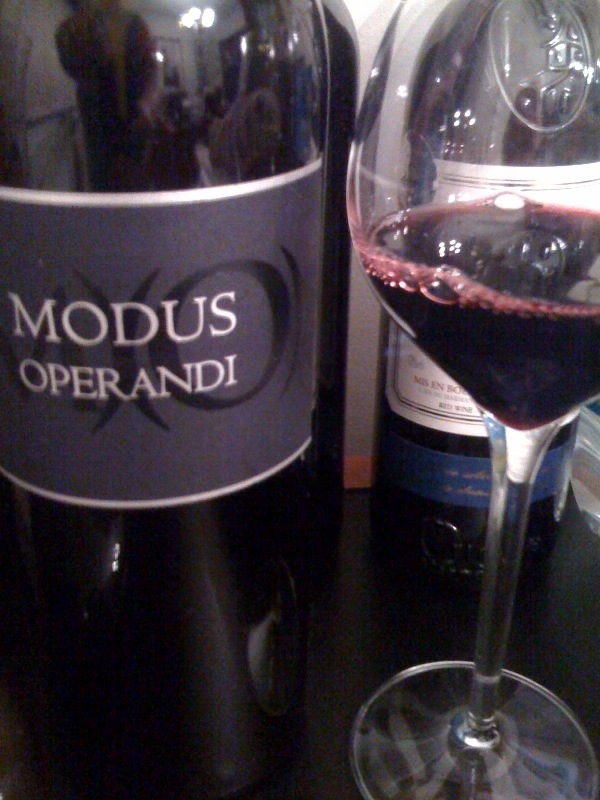 I bought two bottles of Modus Operandi’s 2009 Valhalla before it was gone. Only a single barrel was made (25 cases) and those fellow fans who love winemaker Jason Moore’s creations have figured out that if you want his wine, you have to grab it when you can. I have learned the hard way, you will too by having to wait for his next creation. Valhalla starts off big: sealed in black wax with an oversize bottle, it pours deep purple into the decanter. Focusing closely in the glass, I see black in the center of the glass edging towards purple and finally bleeding into red on the edges as I examine the color. As I swirl I note a higher alcohol content than some of the other Modus wines but very similar to the Napa standard- and this one comes in at 14.5%. The nose offers red cassis, strong black plum, menthol, asphalt/gravel, and a hint of oak. (I had a powerful floral element but the room I’m in is dominated by a huge bouquet of flowers so I’m not going to include the floral element in deference to that outside influence.) Allow me to say simply, the wine smells great. In the mouth, it’s pronounced and powerful- not as balanced as some of Jason’s other creations, but a force to contend with: massive black fruit with bold acidity and strong tannins reel in my lips and cheeks as it swirls in my maw. I take some air and am surprised how much this comes back as tart- “What a perfect complement for red meat!” I ponder, this is a wine that screams rib eye medium rare with a baked potato and creamed spinach. Were it sold by the thousands, you’d see it in the cue with Stag’s Leap, Silver Oak, Opus One. 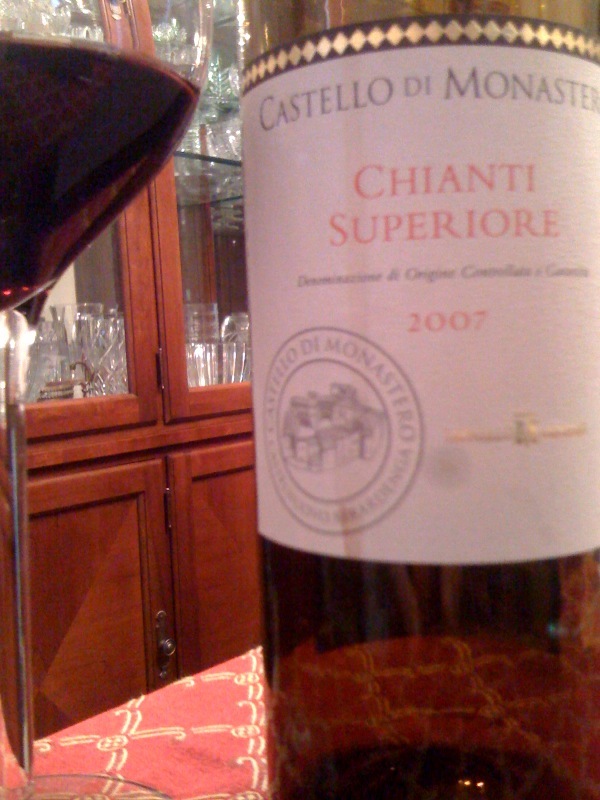 But this is a rare and personal wine, so it will be enjoyed much more privately, and oh so well if paired correctly. I regret getting only a couple of bottles, and now I have to choose the time, place, and company when I will open the next one. I took a moment and in the mirror saw my tongue was completely black/purple from my tastes, and with a big smile I refill my glass. It takes effort to think in detail about the qualities of this wine; like driving a stunning race car, the experience overpower your senses and you just want to drink in the moment, literally and enjoy. This is a hard glass to put down, yet another of Moore’s genius oenophilic concotions too good to contemplate as you savor the last drop and the finish lingers so long in your mouth with the tart aftertaste of an epic wine that serves the namesake well. Afterwards, the empty glass reminds you of the good things life brings you that sometimes are cut short or made in very limited supply. A bittersweet moment? It is better to have loved and lost than never to have loved at all. or in this case, Skål! This is a premiere cru chardonnay from Burgundy’s Cote de Beaune, a wonderful area I’ve spent a good deal of time in during my lifetime, not far from the Eastern border of France. The pure chardonnay grape is evident in the golden yellow color and the nose of peach, honey and wildflowers. This Montrachet (from vines planted literally a few meters from Puligny-Montrachet) is delicately balanced with good, ripe fruit: crisp apple, sweet green pear, and tart grapefruit followed by cassis and French oak, limestone, clay, and a hint of sulfuric bitterness on the finish which is very interesting and points the drinker back to the paired food dish. This wine is beautifully constructed and is built to pair with complex entreés like fish, veal, or chicken, but will stand strongly on its own as a deep and complex chardonnay for those whom like a full bodied and complex white. This matched a teriyaki salmon and teriyaki chichen combination I grilled beautifully, playing off the sweetness of the sauce and the savory fish with skill. I think I could pair this with steak tartare or a carpaccio and have an excellent response. On the second night when pairing with food, I could not detect the hint of bitterness… interesting. This is a lovely wine. Did I mention it’s one of those 90+ that the suppliers rant and rave about? With good reason… it is an indulgence to be savored and shared. Only 25 cases imported to the USA, it is in rare supply and is a delightful treat if you can find it. From $45-90/bottle depending on the supplier and quantity. While you might wince at the price, finding a good Montrachet for $45 can be quite hard to do, so realize you are getting a wine that is really worth $90 if you can find it for significantly less. There’s a very interesting video (the sound is lousy but intelligible) about pairing a fish dish with a $90 2004 Puligny-Montrachet from Bruno Colin at the famed Le Bernadin restaurant by chef Eric Ripert and one of his sommeliers. (I can tell you first hand, this is another complex and delicious white wine that pairs beautifully with fish.) You can find it here. If you might like to see more information about Bruno Colin or the US importer of his wine (Kermit Lynch) a link is found here. Two great (under $10!) Italian values to enjoy! This is a tasty blend of sangiovese, merlot and cabernet sauvignon grapes that form a delicious Italian red not to be missed. 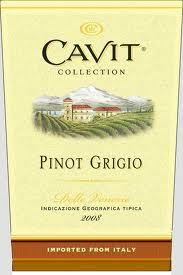 This Italian wine complements many food elements and is tasty and fun to drink. The color is deep garnet with ruby edges turning to brown on the edges. With a nose of red plum, rose bush and cola, it hits the palate with a burst of elements: plum with tart cassis, notes of cherry, charcoal, and tar. Oak and vanilla on the medium finish, this is a wine made to complement a vibrant meal. Price: from 10-16/bottle. (90+ points), available for under $10/bottle online. 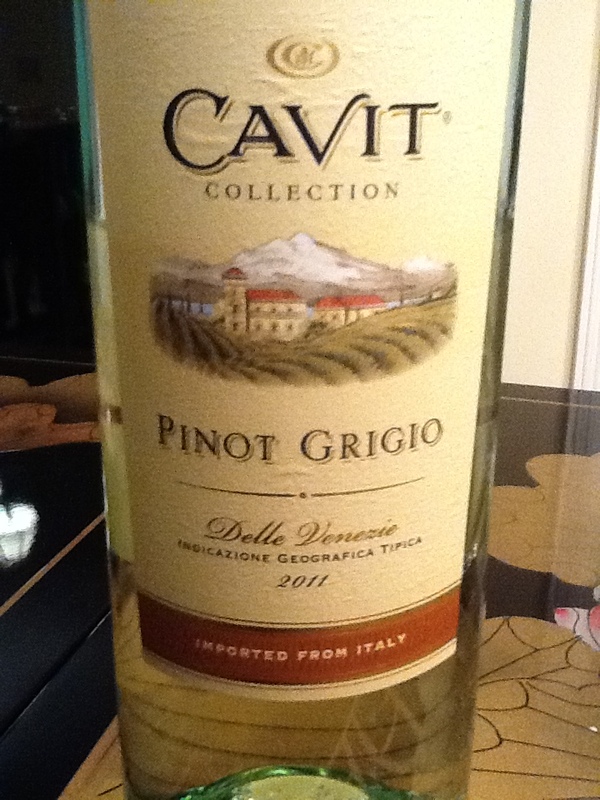 A pale yellow color with a nice floral nose, Cavit is a consistent value of pino gris grape and a great white wine choice for Italian food, chicken, veal or fish or as an aperitif. After the floral nose is a hint of green apple, followed by bright fruit on the palate complemented by a crisp acidity and lemongrass on the finish. $9-11/bottle, every cellar should have some of this wine well chilled on hand for the sunny afternoon or to enjoy with polenta, risotto, potato latkes, blintzes, or pasta with pesto. à votre santé! And to my friend Vincenzo, Salut!